His Holiness Ignatius Aphram II Karim(C), Syriac Orthodox Patriarch of Antioch and All East, held mass on Friday evening at the St. George Cathedral in Bab Touma, Damascus, to mark the 103rd anniversary of the Seyfo massacres carried out by the Ottomans against Syriacs. 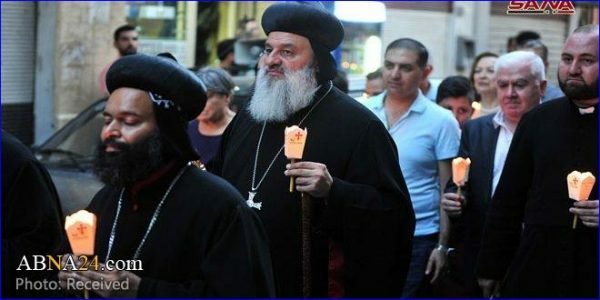 Syriac Orthodox Patriarchate of Antioch and All East held mass on Friday evening at the St. George Cathedral in Bab Touma, Damascus, to mark the 103rd anniversary of the Seyfo massacres carried out by the Ottomans against Syriacs. Presiding upon the mass, Syriac Orthodox Patriarch of Antioch and All East Mar Ignatius Aphram II Karim said that the memory of the Seyfo massacres and genocide committed by the Ottomans in Mardin and Diyarbakir are a reminder that our forefathers fought for their homeland and remained committed to it despite all the killing and torture they were subjected to by the Ottomans. “This is what currently motivates us to remain and stand fast in our homeland Syria and to remain committed to it, defend it, and defeat Takfiri terrorism,” he said. His Holiness prayed for the souls of the martyrs of the Seyfo massacres and all of Syria’s martyrs. After the mass, a candle procession headed by the Patriarch headed from the Patriarchate to memorial park dedicated for the victims of the Seyfo massacres.